The invocation of magical powers. All peoples, civilized as well as savage, have believed and still believe in magical influences and effects. The chief means of harming or of protecting from harm was the utterance of some word or words invested with the highest magical power; and whoever knew the right word had influence over gods and demons; for they could not resist the command, spoken under certain necessary and auspicious conditions. Magic pervaded the religions of the Assyrians, Babylonians, Egyptians, Greeks, and Romans, and in a still higher degree the religions of primitive peoples. According to the Bible the nations which lived in the same country as the ancient Israelites or in that surrounding it practised all sorts of superstitions forbidden to the Israelites (Blan, "Das Altjüdische Zauberwesen," pp. 16-19). The nature of these superstitions can not always be determined. Probably the original meaning of , the root-word by which magic is indicated in Hebrew, is "to murmur" or "to mutter" (Fleischer, in Levy, "Neuhebr. Wörterb." ii. 459). Hence, the magician ( ) was a person who muttered magic formulas; but no example of such formulas has been preserved in the Bible. 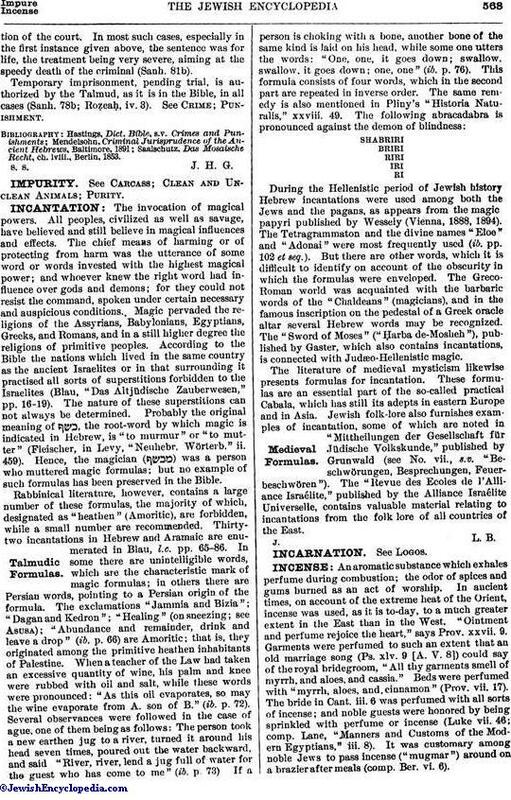 During the Hellenistic period of Jewish history Hebrew incantations were used among both the Jews and the pagans, as appears from the magic papyri published by Wessely (Vienna, 1888, 1894). The Tetragrammaton and the divine names "Eloe" and "Adonai" were most frequently used (ib. pp. 102 et seq.). But there are other words, which it is difficult to identify on account of the obscurity in which the formulas were enveloped. The Greco-Roman world was acquainted with the barbaric words of the "Chaldeans" (magicians), and in the famous inscription on the pedestal of a Greek oracle altar several Hebrew words may be recognized. The "Sword of Moses" ("Ḥarba de-Mosheh"), published by Gaster, which also contains incantations, is connected with Judæo-Hellenistic magic. The literature of medieval mysticism likewise presents formulas for incantation. These formulas are an essential part of the so-called practical Cabala, which has still its adepts in eastern Europe and in Asia. Jewish folk-lore also furnishes examples of incantation, some of which are noted in "Mittheilungen der Gesellschaft für Jüdische Volkskunde," published by Grunwald (see No. vii., s.v. "Beschwörungen, Besprechungen, Feuerbeschwören"). The "Revue des Ecoles de l'Alliance Israélite," published by the Alliance Israélite Universelle, contains valuable material relating to incantations from the folk lore of all countries of the East.